We find more and more these days that brides and grooms are looking at having their wedding receptions in village halls such as Countesthorpe Village Hall. The money saved by going to a village hall can then be spent on accessorising and theming it. With its plain white walls, Countesthorpe Village hall is perfect for LED Uplighting. 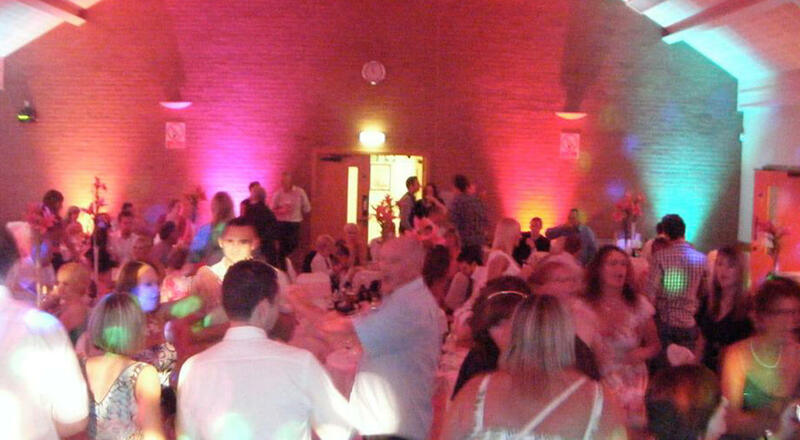 We can use our mood lighting effects to wash the walls of the venue in a colour of colours of your choice. The photos in the slide show above show our LED Uplighters set to a number of different colours inside the village hall. Our dance floors are a perfect addition to Countesthorpe Village Hall as the venue does not have a purpose dance floor, simply a wooden floor which runs right throughout the hall. We have provided a number of wedding DJs to Countesthorpe Village Hall in the past, we typically set up in he morning so that the DJ can then play background music throughout the wedding breakfast as well as providing a radio microphone for the speeches. This also allows there to be a smooth transition between the wedding breakfast and evening reception. To find out more about booking any of our products or services for your event at Countesthorpe Village Hall please don’t hesitate to pick up the phone and give us a call on 0116 2029953, or simply send us an email. We look forward to hearing from you.